If you read the report closely, you’ll see that Iwata doesn’t say that Skyward Sword is taking longer than expected, just that Ocarina of Time is “expected to hit the market earlier.” Since Ocarina 3D is slated for a “Spring 2011” release in Japan (remember, he’s talking to Japanese investors here), that means it’ll certainly debut in April, May, or early June. The way Iwata puts it sounds as though it’s a simple case of Ocarina of Time being the project that’s closest to completion, not that they’re going to wait a while before they release Skyward Sword. Some have said that it’d be a bad idea to release two major titles in the same franchise close to each other during the sales years, but I disagree in this case. Since there are only going to be a limited supply of 3DS units during its first few months on the market, and with the Wii user install base already many millions strong, neither game would suffer much from competition with the other if they both came out within a month or two of one another. New 3DS owners could pick up Ocarina of Time, while Wii owners who might not be able to pick up a 3DS until later will still be able to enjoy Skyward Sword. Just yesterday I complained about a lack of Wii titles on the horizon, and wondered why, in light of this, we didn’t have any news on Skyward Sword‘s release. Well, if the newly-revealed Pandora’s Tower is any indication, there might not really be a lack of Wii software at all. And since we now know that Kirby Wii isn’t just a figment of our imagination, combined with news of the upcoming Rhythm Heaven for Wii, it could be that there just isn’t a clear spot on the imminent first-party release calendar for Skyward Sword to fill. While we don’t have any information about when Kirby or Rhythm Heaven will debut, we do know that Pandora’s Tower is planned for release in Japan during Spring 2011. The other two games might not be far behind, and who knows? 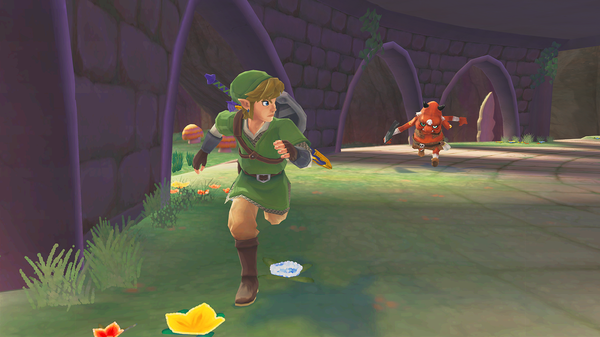 Skyward Sword may still be right around the corner. Nintendo has been dedicated to delivering near-worldwide releases for all of their major franchise titles, and in recent years they’ve delivered with international debuts for Twilight Princess, Spirit Tracks, the Super Mario Galaxy titles, and Metroid: Other M. It could be that they want such a major and highly-anticipated title as Skyward Sword to get the same attention, rather than releasing it farther ahead of time in Japan. On the one hand, it shows dedication to their worldwide audience, and on the other… well, if certain aspects of Skyward Sword wind up getting negative attention (see Other M for a good example of this) the impact on sales will be minimal if there’s no large gap between regional releases. Iwata expressed some interest in the fact that Zelda‘s 25th birthday is this year, making mention of last year’s Mario celebration worldwide, so I’d say it’s reasonable to guess that something might be in store for Zelda fans this year. The series turns 25 in Japan in February, but its birthday isn’t until about six months later in America. What better way to celebrate than with a special Skyward Sword bundle of sorts? Perhaps pack it with a limited-edition gold Wii Remote Plus, or even a special gold console? This might also explain why Ocarina of Time 3D is coming later as well.